Closet organization may be something that not everyone wants to do. Organizing a closet, especially if you have lots of clothes, shoes, and other accessories, can take up a lot of your time. Some may even resort to hiring closet organizers because they have neither the time nor the skills to reorganize their closets. However, closet organization is actually very easy. With these steps you can whip your closet back into shape in no time. Take everything out, so you can have a blank slate to work with. This makes arraigning and determining which goes in a lot easier. Warning: Failing to take everything out can put you at risk with falling objects from overhead compartments. It will also take a longer time to reorganize if you keep on pulling stuff out or repositioning them inside the closet, instead of simply putting things back in. Sort your clothes into those you want to keep, those you want to throw, and those you want to give away. This will make sorting easier and faster as well as leave more space in your closet for other items to reduce clutter. Do the same for shoes, scarves, ties, underwear, etc. Warning: Failing to sort the contents of your closet into piles will cause you more time and energy. This will make putting things back more difficult. Organize your clothing by color. This will make your clothing easier to look for and easier to match with other types of clothing. Store smaller items, such as cuff links or jewelry in small zip lock bags for easy storage. Warning: Storing small things in zip lock bags will prevent any losses. Small earrings, rings, and necklaces can easily get lost in the tangle of organization, so make sure to have them tucked away first. Add additional shelving or vertical storage if more space is needed. If you cannot add additional shelves, you can buy metal or wooden racks or plastic cabinets as substitutes. Warning: If you don’t want to start throwing out perfectly good clothing or pieces of shoes, hats, ties, and other things that you love out of your closet, make way for more space. It’s either extra shelving or lugging your stuff down to the basement for storage, if giving them away is not an option. An organized closet is everyone’s dream. There is nothing better than opening a closet and seeing rows upon rows of properly folded and hung clothes, shoes on their racks, and jewelry in their cases. The good thing is, just by taking the contents and properly sorting them out, you are already halfway to having that dream closet you’ve always wanted. Organizing Your Refrigerator – How to organize things at home. 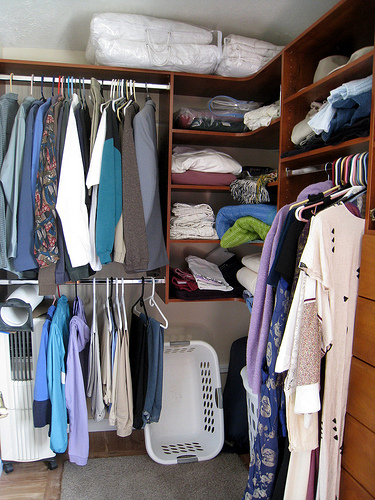 Maximizing Closet Space – Organizing closet and home-related works. Cleaning Your Refrigerator – Cleaning and maintaining home furniture and equipment. Post-party Clean-up – Cleaning up and organizing the clutter at home. Putting Wallpaper Properly – Keeping your home beautiful and well-organized. Setting-up the Bedroom – On how to set-up furniture in your home. Closet Organizer – How to organize closet and other things at home. Before I organize my closet, I make sure that i take everything out from the closet and I clean the space first. Next, I sort all of the clothes which I can still wear or clothes that I can mix and match with other items. I organize my clothes by type first. For example, I sort out all of my skirts, shirts, pants etc. after i sort out all the clothing type, i organize it by color. Lastly, I organize my shoes by putting them in a nice clear colored box and i put labels on each box (e.g. Snake-skinned peep toe pumps) so that i can easily identify the shoes that i’m looking for. Organizing your closet is fun but very tiring. Usually i do this every summer and I make sure it is scheduled on weekends. I just had the chance to clean my closet, literally. I pulled out items that I cannot and will not use anymore and arranged my clothes by type (not by color). By this I mean that all dresses should be hanged, all jeans should be on that side and all t-shirts and blouses should be folded here. I also arrange my underwear by putting them in a large box and categorizing them as beach wear, everyday underwear and occasional underwear (like strapless brassieres, thongs, etc). I also put the items which I don’t use that often to the innermost part and things that I use everyday on the outermost part. Another helpful tip is to have hangers of different colors (to organize clothes by color) and by putting labels on items that are stored on boxes. I helped out my sister in cleaning her closet just last week. She sorted all her house clothes apart from her work clothes. She also put a name tag on her drawers for her scarves, socks, underwears and accessories like belts. All her blue jeans and jackets are folded. Slacks and sweaters and hanged. All her blouses are separated by types like long sleeves and sleeveless. She gave me some of her clothes that doesn’t fit her anymore. She said not only did she save space on her closet but she can always get it in my room anytime. I once organized my closet and at the first glance of it… it already made me feel like giving up. I feel as if it’s going to be very difficult but I just had to do it. While I was cleaning and organizing it, I noticed that I had a lot of stuff lying around. Stuffs that are useless and only adds dust in my closet. I picked it all up and settled it in one place. After I cleaned my closet, I started arranging or organizing the things where it should be placed. I noticed again that after cleaning and organizing my stuff in my closet. I feel so refreshed and very happy of what I had accomplished. You shouldn’t be swamped and overwhelmed by the disorganization because it does’t take rocket science to fix the mess. My mom is a pro at this, it is true that everything has to be taken out first to help you envision and plan that neat and organized look in your closet. When I was a kid until I was a teener, my mom would still help me organize my closet. Whenever she notices clothes that I have grown out of, she’d tell me to just give it away to my cousins or to anybody who fits them better, which I gladly do up to now whenever I have a shirt or pants that I don’t use anymore. Also, to avoid having creases on your shirts, use of plastic hangers (if your closet has the space) they also help you have extra spaces for other things that have to be folded. Make use the drawers for smaller clothes like your underwear, socks, ties, hankies, and the likes, it will let you find them easier knowing they’re all stored in the same place. And when you’re already done, be mindful not to pull out your clothes carelessly next time you need a shirt or a pair of pants, don’t be so clumsy and realize that you’re going to have to deal with the mess if you’re not careful. It is best to practice organizing your closet every-so-often and not wait until it’s in complete disorder. Just a week ago, I cleaned up my room and included the closet. I took out everything and lay it all onto the bed. The reason why I did so is because I tend to put it off till tomorrow until I couldn’t finally finish it. If it’s on the bed then I have no choice but to finish it all in a day or I would be sleeping on the carpet. I never realized that I don’t use half of my clothes anymore. I segregated them according to what I want to keep, what can be given away and what can be recycled. Instead of throwing your clothes into the landfills, it’s better to make rags out of it. And then, I arranged them according to type. All pants go together, all skirts, office attire etc. Then, I put together same colored clothes for easy access later on. So my closet is arranged according to type and according to their respective colors. Since you’re putting so much effort into cleaning that closet, might as well do it correctly. Shoes should not be in the same closet as your clothes are. They tend to get all the germs in the streets you walk into. You don’t want those germs to migrate into your clean clothes, right?